Every city has distinctive identity: its structure, architecture, memorials, historical monuments and public art contribute to uniqueness of cityscape and create specific features. “Public art supplies another layer of sensitivity to the development process, complementing (and challenging) the work of architecture and landscape design”, said the artist David Patten. The history of public art started in Greece, when Greek sculptures were placed in public spaces. One of the main examples of public art in Ancient Greece was in Athens – Parthenon (c.447-422 BCE) on the Acropolis. Later, the Roman Empire placed statues of the Emperor in several places to emphasise his power. Since then sculptures, monuments, religious statues have been an inseparable part of a nation’s culture. Nowadays, public art becomes not purely aesthetic but also functional. For example, in Barcelona there are seating areas that incorporate Art Deco sculptures and street lighting. The definition of public art is not universal, different people and organisation offer different descriptions. McCarthy (2006) suggests that public art is “site specific … in the public domain”, however the type of art is not specified. Others (Hamilton et al, 2001) identify public art in five different forms: sculpture, functional objects, architectural features, landform works and temporary forms. Public art can be of different sizes and of different mediums; it can be a major monument such as The Eiffel Tower in Paris or hidden somewhere in the neighbourhood. In this essay, public art is defined as an art object of any size or medium that has been planned and executed for a specific space accessible for the general public. Public art is a legacy of a nation and is rarely sold. There are some examples when art has been nearly sold, but the public signed a declaration and prevented the sale. For example, Henry Moore “Draped seated woman”located in a deprived area of London was announced for sale in 2012 according to The Guardian (2012) for almost £20 million. People stopped the sale by collecting more than 1,500 signatures in just a few days. Since public art is rarely sold it is difficult to talk about its value. When talking about the value of public art two sides should be considered: cultural value and economic value. This essay will analyse how public art ads cultural value to the society and the city, as well as how public art relates to financial value. The cultural value of public art is the major component of the value overall. Every day that the sculpture, monument or a statue is on display it gains recognition and cultural value. Non-tangible value of public art includes education, a memorial for historical events, cultural heritage, national identity, inspiration and aesthetic beauty. Public art to a large extent is covering important national events from the past to honour the memory of ancestors or important historical events. Each large city is full of historical monuments and significant figures. These monuments have different functions: honour memories and educate population. They can be seen as inseparable identity of the city. How can these monuments be valued? 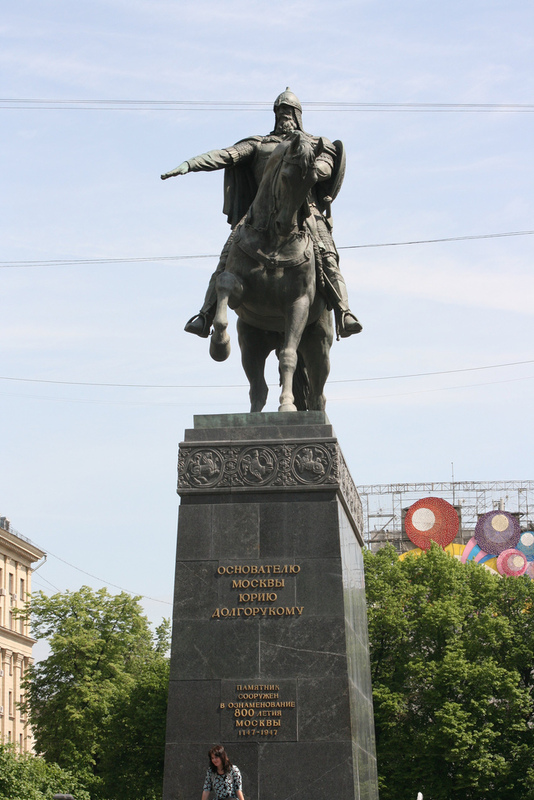 For example, the bronze monument to Yuri Dolgorukiy in the heart of Moscow, Russia, was built in 1954 to honour the prince and founder of Moscow. The life-size statue portrays him on a horse. Four architects and artists, S. Orlov, A. Antropov, N. Shtamm and V. Andreev, worked on the design of the monument, which was commissioned for the 800th anniversary of the founding of the city. The statue’s initial cost was 5.5 million rubles of state funds – a huge amount at that time. If the statue was sold today what would it be valued at? If inflation is take into account, the value is many times more than the initial cost, but what about cultural value? This monument is a part of every history book and every educated Russian person knows what it looks like and where to find it. The architects became famous after creating this statue. The educational purpose is undoubtedly important. The statue is not only an honour for the founder of the city, but also an example of the art movement at the time of creation. This piece of public art is extremely important landmark for the city and as a part of Russian cultural identity. No financial figure can reflect its historic and cultural value. The education and inspiration provided by public art are extremely important factors. Public art educates from a historical perspective and/or educates about art. Public art is like an open-air museum; the artwork has a label with key information. People can read who or what it is and who created it and why. By surrounding citizens with art their appreciation for art increases and they become more educated. In the Forbes magazine interview (2009) Darren Walker, vice-president of the Rockefeller Foundation and vice-chairman of the Foundation for Art and Preservation in Embassies, said that an educated and civil society is impossible without public art and it lifts up humanity and challenges individuals to think differently about the world. Public art is open to the public at all times and people can analyse, explore the details not restricted by opening hours in museums or large crowds in closed spaces. They can return to it many times and discover something new and see it differently. Non-for-profit organisations such as Forecast Public Art in America add educational value to public art. This organisation creates and manages walking tours around public art and explains the aesthetics, idea and story behind it. The idea of the organisation is to bring artists and community together, so local artists volunteer to give the tours. Public art is valuable for art and architect students as they study proportions, composition, structure and other aspects. Urban planning students can also benefit from public art and study how the artworks are positioned in relation to buildings and streets. Becker (2004) in Americans for the Arts public report “Public Art: the essential component of creating communities” suggests that public art shows the diversity of the city. In different parts of the city there are different styles of artworks and they correspond to diverse nature of neighborhoods. Moreover, public art is dynamic and new artworks represent new demographics of the city and changing tastes. Each nation has a different history and artistic characteristics. Italy is always identified with the Coliseum and the Statue of David. When people think of the UK they think about Big Ben, London Eye and red telephone boxes. History and identity is built through developing public art, as art reflects culture and society. The existence of public art in a country becomes valuable as a whole, not as individual objects. The national identity is represented by public art. If the piece of public art is not an abstract object, but a figure, it represents a significant person or event with a lot of emotional attachment. Every country has important statues of national heroes, leaders, key thinkers, writers, artists and folklore characters. The value of public art can be gained either through the importance of the artist who created it or through the subject matter of the art. There are a lot of sculptures that are crafted by relatively unknown artists, but the figure portrayed is a national hero and carries cultural value. In war conflict or revolution the first things that are destroyed by the victors are statues of people of power. For example, in Iraq the local opposition pulled down the statues of Saddam Hussein. For the nation these public statues, form of public art, represent the cultural value that they no longer supported. Finally, the value of public art is that it generally improves the urban environment and provides aesthetic beauty for citizens. It is nice to walk in parks and streets that are different because of unique monuments and art objects. These add something special to the environment and create an understanding of being in the particular place. People are more relaxed and thoughtful when surrounded by beautiful sculptures and statues. By developing outdoor public space and decorating it with art governments promote walking and sense of wellbeing. It is challenging to value public art in public spaces in financial terms because its cultural and economic values are interrelated. Usually there is a direct fee involved in the production of the object which can be considered as the monetary value of public art. However, this fee does not fully reflect the monetary value of an artwork. Public art has indirect financial impacts on the artist and the surrounding area which should also be taken into account. For example, artwork displayed in public space adds cultural value to the artist who created it and is likely to increase prices for his/hers artworks. Public art also has Bilbao Effect: increases foot traffic and, therefore, boosts the local economy. Finally, the real estate market is also influenced by public art, as nearby properties increase in value. Each of these points are analysed in details bellow. These expenses are a direct investment in public art. They vary depending on the recognition of the artist, material used, size of the work and the legal complexity associated with installation and authorisation of a particular public artwork. 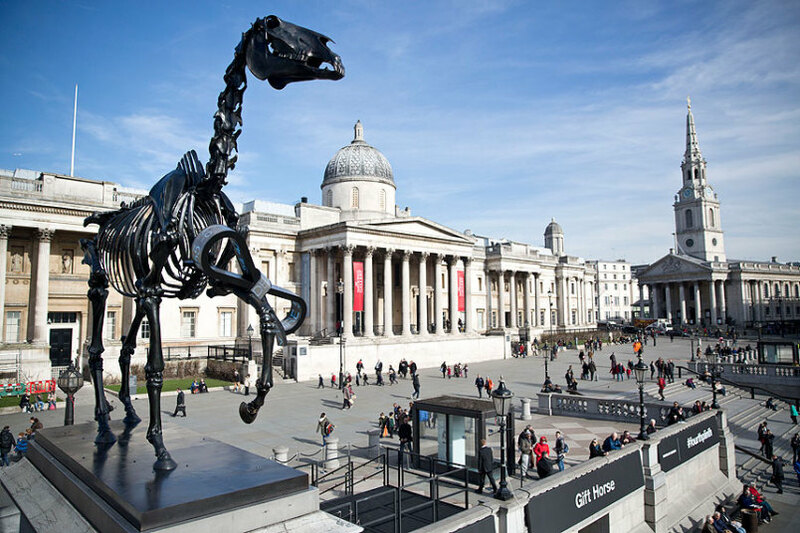 Public art is commissioned by local authorities, for example, the Fourth Plinth on Trafalgar Square. Alternatively, public art is sponsored by not-for-profit organisations such as Project for Public Spaces or Americans for the Art, where the money is raised through private and public donations. According to Ixia’s (2013) public art survey “The public art sector’s overall value increased slightly from £55 million in 2012 to £58 million in 2013”. This indicates increase in number of commissioned artworks or their value reflecting an increased interest in public art in the UK. For the artist – being commissioned to create an artwork for public a space is a sign of recognition. His/hers artwork on a public display increases knowledge of his/her style and work. A gain in cultural value trough exhibiting in the public space (Pettersen, 2014) transfers into gain in economic value. How does it affect the value of public art if the artist has gained international recognition and tripled his/her prices compared to the time he/she installed the work? The value of public art depends on the reputation and value of the artist. Hence, it gets even more difficult to estimate the value of public art. Public art attracts visitors and increases foot traffic. Increased foot traffic boosts the local economy: gift shops, hotels, restaurants and cafes open nearby to satisfy new levels of tourists. This can be related to so-called Bilbao Effect. “For urban planners, politicians, museum directors and trustees, it [Bilbao Effect] means the transformation of a city by a new museum or cultural facility into a vibrant and attractive place for residents, visitors and inward investment”, says The Art News Paper. Bilbao Effect usually refers to large cultural facilities such as museums or art fairs rather than a single public statue or element of architecture. Nevertheless, public art facilitates growth in the local economy. It is difficult to estimate the economic affect of public art in real terms because the correlation between the installation of public art and improved local economy is not exact. There are many other factors that may influence local business, such as general improvement in the area or appearance of new real estate development, which may be the reason why the art is put there in the first place. Lundi (2012) in her study “Public art – purpose and benefits: exploring strategy in the New England city of Pittsfield” pointed out that there is lack of research and empirical evidence of how much of positive effect there is on local economy. Moreover, McCarthy (2006) suggests that the positive effect on local economy from public art is more of a “belief” than empirical conclusion. However, it might be argued that cultural regeneration also involves public art and it is an inseparable part of the urban planning. There are some cases in whi ch the art appeared first and then the economy boosted. For example, Park Guell in Barcelona. It is a park created by Antoni Gaudi in the early 20th century that is a massive tourist attraction today. The infrastructure improved since the park was opened to the general public and now it is surrounded with small cafes, hotels, taxi stations, souvenir shops and other small businesses. In this case it is known that the public art appeared first and then local economy improved to facilitate a large number of tourists. There are three different types of regeneration driven by culture identified by Evans (2005): culture-led regeneration (large scale developments that drive regeneration), cultural regeneration (when culture is integrated in urban policy) and culture and regeneration (when small objects of public art facilitate regeneration). Public art falls not only in the third category, but more and more often in the cultural regeneration as well because public art becomes a part of real estate developments. This brings us to the next aspect of the economic value of public art. Modern real estate developments are introducing public art as a part of their project. In some countries, like in America, it is required by law to spend between 1% and 5% of total value of the new development on art. The structure is called “Percent for Art”. Introducing art as a part of a real estate project is part of cultural regeneration, where art and urban planning policy meet. There are many stakeholders in public art in new developments such as tenants, builders, artists, local community and real estate developers. Public art in real estate complexes promotes education, improves aesthetical image of a development and creates a colourful image. However, for the real estate sales prices public art is also important because prices depend on location. Properties that are close to sculptures or have a view from the apartment on the art object are generally more expensive than those that have nothing special in their surroundings. This variety in price that depends on public art can be seen as indirect value of art, as the value of real estate is enhanced by a particular piece of public art. This applies not only for real estate developments, but also for all properties. Generally a property with a view is more expensive than without. In this case “extra” value provided by public art depends on how well known the artwork and the artist are: if the property is overlooking a public art landmark such as Big Ben the mark up for a view will be higher than if the same property is facing an unknown sculpture other things being equal. After describing different aspects of the cultural and the economic value of public art there are two examples that illustrate these values. Every autumn in Britain a paper poppy becomes a part of people’s lives, which they wear to honour veterans of war. In July 2014 it was no longer a flower on someone’s coat or scarf it became one of the most visited public art installations in the history of the UK – “Blood Swept Lands and Seas of Red”. 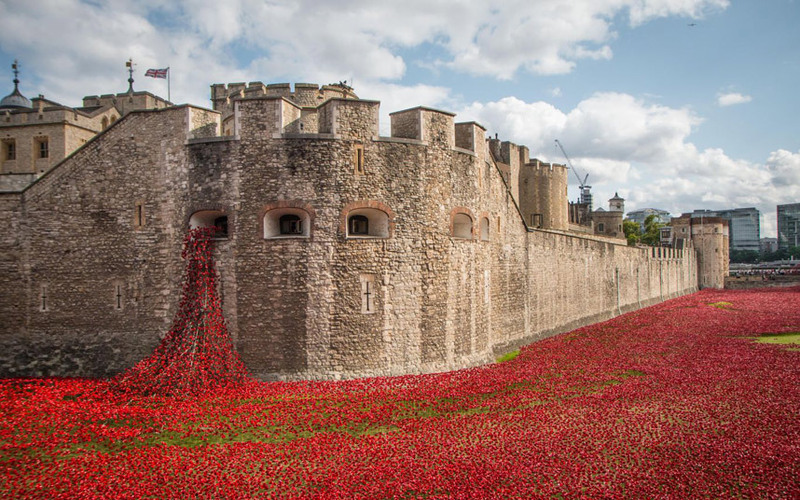 The Installation of 888,246 ceramic flowers two-feet tall covered a massive space next to The Tower of London. Each flower represents a British or colonial fatality in World War I. Artist Paul Cummins designed the installation, poppies were placed individually by thousands of volunteers staring from 17th of July until the Remembrance Day – 11th of November. Then most of the poppies were sold for charity and around 10,000 poppies went to the Imperial War Museum in London. This installation reflects everything that is valuable about public art, combining high cultural and economic value. “Blood Swept Lands and Seas of Red” was all over the news. The Royal Family as well as the Prime Minister came for the opening and planted a poppy. The story and idea behind the installation were explained many times in the media, which was a free educational lesson. Millions of children might have learned something new about their history and relatives that they might have not known otherwise. The installation was so massive, beautiful and significant that people travelled from across the country to see it. It has been estimated (Marketplace, 2014) that around 4 million people from England and Ireland came to London specifically to see the installation. In economic terms it means that this piece of public art boosted the economy: train tickets, hotels, restaurants and gift shops. This installation influenced the economy indirectly, by increasing tourist numbers, but also by raising money from selling poppies – £25 each. Money raised from the sale – £15 to £25 million – covered all costs associated with the artwork and 10% went to different charities such as Help for Heroes and Combat Stress. This is an example of how public art can be beneficial not only culturally, but also financially. Trafalgar Square Fourth Plinth is another interesting case of displaying public art. Three out of four plinths on the main square in London have statues installed in 19th century; however, the fourth plinth initially designed for a William IV statue, remained empty due to lack of funds to create the statue. Since 2005 the plinth has been occupied by contemporary art sculptures that were selected by the commission that is led by the Mayor of London’s Culture Team. There are many proposals submitted each year and only six are selected for the next stage. The mini-versions are presented to the public and then the committee decides which one of the six is going to be commissioned. According to the a member of Arts Council in London, Joyce Wilson, this project plays an important role in engaging audiences in debate about arts and culture generally, and art in the public realm in particular. Alastair Sooke (2013) from “The Telegraph” argues that the process of choosing an artwork for the plinth is not truly democratic and it is not fair that small committee decides what people are going to look at for next year or so. The plinth on Trafalgar Square becomes an attraction; people are travelling to see the sculpture and are excited about what is coming next. This is a perfect example how public art can be dynamic and reflect the culture of a city. There are different types of public art: temporarily exhibited like “Blood Swept Lands and Seas of Red” or those created and still standing by the ancient Greeks. It is extremely difficult to value public art because it gains in value every day and involves so many indirect issues. Public art shapes the national identity alongside its culture. Cultural and aesthetical values combine with the economic and financial values to create a notion of how valuable public art is. The thing that is clear is that public art is beneficial for cityscapes, societies and economies. Public art inspires people, decorates cities, and stimulates tourism and regeneration. Hamilton, J, Forsyth, L., & De Iongh, D. (2001). Public art: A local authority perspective. Journal of Urban Design, 6, (3), 283-296. McCarthy, J. (2006). Regeneration of cultural quarters: Public art for place image or place identity? Journal of Urban Design, 11, (2), 243-262.